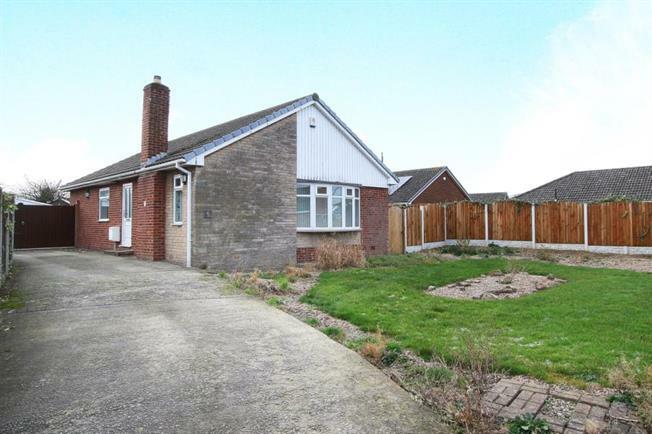 3 Bedroom Detached Bungalow For Sale in Sheffield for Guide Price £235,000. A fantastic opportunity has arisen to acquire a well proportioned and attractively presented THREE bedroom detached bungalow, superbly located on a quiet cul-de-sac within the popular semi rural village of Todwick. Standing on a fabulous corner plot, and benefitting from generous gardens to the front and rear, a good sized driveway providing ample off road parking with access to a detached double garage. The property itself has a front facing spacious lounge through dining room, modern fitted kitchen with integrated appliances, utility cupboard, spacious bedrooms and attractive family bathroom. Ideally suited to buyers wishing to downsize, or equally will make a fantastic family home- being well placed for local amenities, schools and the local park. There are excellent transport links a, and also close to Kiveton Park Train station. The accommodation in brief comprises: entrance hallway with double cloak cupboard, built in storage cupboard, loft access and Karndean to the floor. A door leads into the L-shaped lounge through dining room, having both front and side facing windows and the focal point being the fire surround with living flame gas fire. Fitted kitchen has a range of attractive cream high gloss wall and base units with integrated appliances to include gas hob, electric double oven, fridge and slim line dishwasher. Tiling to splash backs, breakfast bar area, Karndean flooring and a utility cupboard which houses further storage space and plumbing for an automatic washing machine. Master bedroom benefits from a range a built in wardrobes with over bed storage, has Karndean to the floor and French style doors accessing the rear south facing garden. A second double bedroom has rear facing tilt and slide patio style doors accessing the rear garden, and Karndean to the floor. Bedroom three has a built in storage cupboard and Karndean flooring. Family bathroom benefits from a wash hand basin in vanity unit, low flush WC, bath and separate shower cubicle having mains shower within, ladder radiator, tiled walls, Karndean flooring and spot lighting to the ceiling. Outside: to the front of the property is a lawned garden, side driveway and double gates leading to a further driveway providing off road parking, detached double garage. The generous South facing rear garden benefits from both a lawn and flagged patio area. An internal inspection is strongly advised.